16 Your eyes saw my unformed substance; in your book were written, every one of them, the days that were formed for me, when as yet there were none of them. I’d like to point out that this passage is not just talking about babies. Though it is absolutely true that every pregnancy is part of God’s sovereign plan to ultimately bring Him glory (more about that later), these verses go beyond pregnancy and “babyhood”. Why do I say this? Because the author, King David, writes in the present tense, “I am fearfully and wonderfully made” and he isn’t a baby when he writes this. We see that David praises God for the way he is at the moment he is writing, and he reinforces this idea in verse 16. David is purposefully praising God for God’s sovereignty over the entire length of his life. These verses contain language that is not only referencing David’s existence for x-number of years on this earth, but also what David was like in those years. Words like “frame”, “intricately woven”, “substance” refer to David’s physical body. 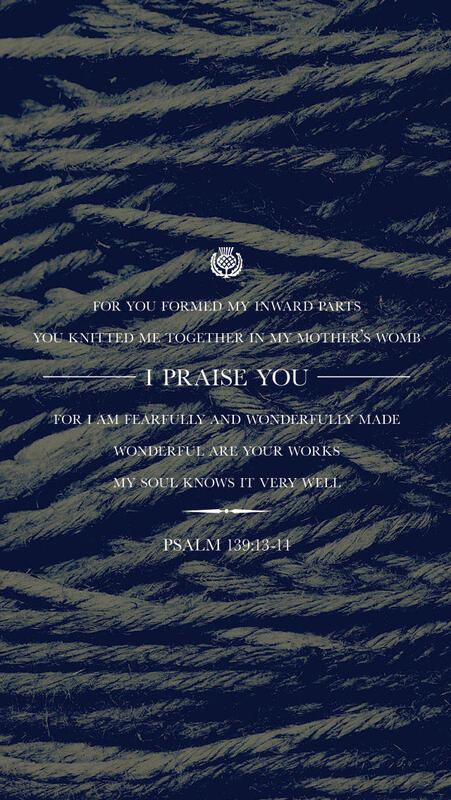 So, we see that in connecting the two ideas of God being in the details of David’s physical form, and also in his length of days, his declaration of “I praise you, for I am fearfully and wonderfully made” is extended and magnified from David’s development in his mother’s womb, through all the changes he goes through in life (yes, even the “negative” changes), to the end of his days on earth! When was the last time you praised God for your physical appearance? A bit convicting, isn’t it? Now, because of sin, we will get sick, we will suffer physically, and we will die. That is NOT how God originally intended for life to be, see Genesis 2! BUT God is sovereign, which means everything is in His plan, and His plan is to bring Him glory. God is not going to skimp on giving Himself glory, so whatever happens is going to give Him the MOST glory possible. How does that apply to praising God for our physical appearance? It means that every wrinkle, scar, acne flair up, grey hair, broken bone, cancer cell, bunion, loose tooth, stretch mark, virus, and infection (and everything else) is part of His plan! Ready for something even more amazing? Romans 8:28 promises that “all things work together for good, for those who are called according to his purpose”. So, in a culture that prizes youth and physical perfection above nearly all else, I can say that the countless stretch marks I have from my pregnancies are “beautifully and wonderfully made” for my good and for God’s glory. That is something worthy of all our praise! Previous Post New things for Christmas!